TEXAS – The floodwaters from Hurricane Harvey rose outside Donald’s home, but he and his family didn’t notice until it was too late. When he looked out the window, the street was flooded and the water started rushing into his home. Donald, his wife, and their daughter grabbed what they could, but in those few short moments the water rose to three feet inside their home. As if the height of the water wasn’t problematic enough, it was also moving. Together, they set out into the rushing waters. When the waters finally receded, Donald’s house was left in ruins. There was no way they could live there. His wife and daughter went to stay with family across town while Donald moved into a trailer behind the house. Months later, many relief organizations have pulled out of Texas after offering immediate relief to Hurricane Harvey victims. But Operation Blessing is still on the ground, coordinating volunteers daily to help families in need. 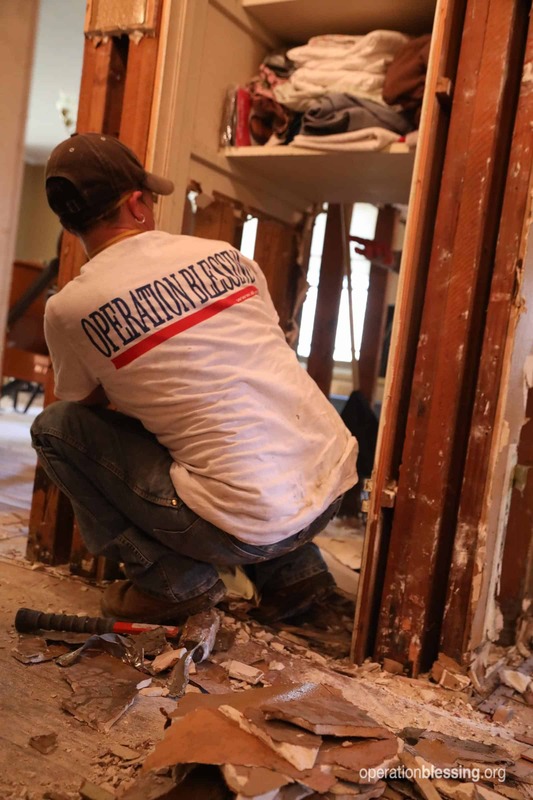 Donald could not handle gutting his home alone, but thanks to Operation Blessing, he did not have to. 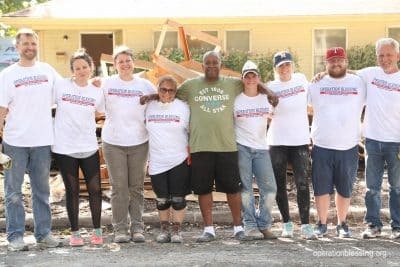 A team of volunteers had just driven from Austin to join the OBI relief efforts in Donald’s city. When they learned about his home and family, they rushed to help. An army of white T-shirts filled Donald’s home and lawn, tearing out damaged sheetrock and carpet. They carried debris to the curb and conquered the mountain of work in no time. “To see Operation Blessing show up and do the work that they did, it gave me a sense of hope,” Donald said. Operation Blessing is planning to stay on the ground in Texas for several more months providing relief to Hurricane Harvey victims like Donald. Just spent a week in Rockport with Samaritan’s Purse. Do you still need teams in Beaumont or Houston area? What type of work? I’m a widow residing in Beaumont, Texas, in desperate need of help restoring my home to acceptable and quality living standards. I’m a victim of Harvey and damage due to flood water inside my home. I’ve been reduced to no interior finishes, no insulation, no safe bathroom facilities, flooring is falling out from under me, no central AC/Heating and only receiving my late husband’s pension as income, I cannot afford these necessary repairs to restore my home to it’s previos condition or even find a contractor to give me estimates or bids to do the work on paymenr plan. My mental condition is worsening as I struggle to remain positive that this will one day be over but I’m unable to sustain employment due to this traumatic chaos in my life right now. I had some money saved, FEMA help and ThirstyGround I’ve been able to replace some insulation, some subflooring, some drywall, some cabinets, a range, a refrigerator, and a bed. But it’s all unfinished and not a home, just a shelter. I’m bleessed to have it, as I know that there are others less fortunate, but my home is paid for and I was preparing for my retirement. I can’t afford another mortgage at this time in my life. So I am seeking some assistance to help me back to a comfortable state if living standard, help me process this devasting trauma and get me back to where I was before Harvey came. I’ve been all over the internet looking and researching all avenues, so any advice you could provide would also be greatly appreciated. I pray that our Father in heaven is directing my path to the necessary means to provide me with connections and resources to complete this task of restoration. This will restore my peace, happiness and security for my day to day life and future retirement plans. I am thanking you deeply from all of my heart that is left to give you, in advance, knowing that all is well with my soul. We’ve forwarded your request to our disaster relief team. Wishing you the best.